Established in 1994, Mythen Construction Limited has grown to become a nationally recognised Main Contractor having successfully completed hundreds of projects across all ranges of the Construction Industry in both the Public and Private Sector with values ranging from €250,000.00 to €30 Million. Our history, experience and trustworthy reputation allows our company to ensure that your project is delivered safely, to the highest standards and in accordance with agreed programme and budgets. Our Company love a challenge and this ethos allows us to bring a unique energy and vision to every project we undertake, always striving to deliver beyond our customer’s expectations. In all our undertakings our principle of value for money, quality customer service and on –time completions have been applied to ensure a seamless project delivery for our customers. Our flexible Company approach ensures that our Customer’s unique requirements always retain priority throughout each project. The award winning St. Johns College Refurbishment & New Residential project – Waterford. Mythen Construction Limited are an “A” rated Safe T Certified Company who operate with a total commitment toward Health & Safety. We are ISO 9001 : 2015 registered for our Management Systems. 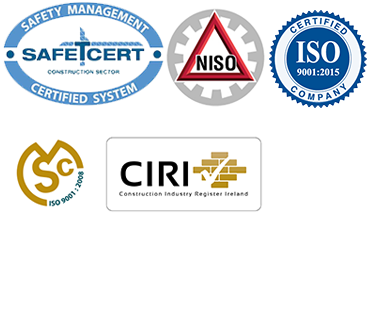 We are CIRI Registered (Construction Industry Register Ireland), and a member of NISO. All site management are trained and accredited to the highest standards. Health, Safety and Welfare at work is also a major consideration in the procurement and appointment of our chain suppliers. Mythen Construction Limited continues to invest in technology to ensure that our company offers customers latest efficiencies throughout all aspects of each project from inception to final completion.